One of the buyers felt no heel pain while wearing the shoe. A lot of testers admired the stability it provided. Some purchasers mentioned that the shoe was comfortable. According to those who have tried it, the Brooks Transcend 5 was supportive. The majority of the consumers noted that the shoe has excellent quality. The Brooks Transcend 5 has a fantastic look, according to many buyers. The shoe has a roomy toe box, based on observations. A good number of testers agreed that the shoe was lightweight. Some of the users said that the cushioning was stiff. Several testers commented that they took several runs to break in. According to some buyers, the upper area was unresponsive. The Brooks Transcend 5 has made many purchasers contented and happy because of its attractive look and roomy toe box. Aside from the design, this brooks running shoe also delivers the right amount of support and comfort. While other wearers have issues with its stiff cushioning, others still recommend the shoe because of its quality. Overall, the Brooks Transcend 5 is an excellent choice for those who are looking for a comfortable yet lightweight stability shoe. Before we begin, it’s important to point out I was sent these on the house for testing purposes. I wasn’t paid in any currency but the shoes and the deal was in no way conditional on a favorable review. In fact, after I informed Brooks that I like a neutral-ish shoe for medium-high arches, I received stability shoes for flat-medium arches and didn’t even get the color I’d asked for. So I started running in these with a chip on my shoulder. I wouldn’t have bought these shoes for myself. Any respect these shoes get would have to be earned. First and most importantly, Brooks Transcend 5's sizing is dead-on. Seems like lately, I’ve had a rash of shoes that were a little too big, after I’d gone years in a men’s 9.5, across several brands, consistently getting a good fit. These ones are a return to normalcy. This is important when you live in a small town and don’t have the opportunity to try on shoes in a store. Sizing aside, the fit was a little off at first. I like a snug midfoot, but this one was snug in the wrong way, somehow. It’s as if the shoes were meant for someone with different-shaped feet than mine (maybe with flatter arches?). The first 3-4 runs in these included frequent stops to fiddle with the shoelaces to try and get them to fit better, but after logging about 100 km, the fit has improved, but it’s still a little strange in the midfoot. While I could gripe about the fit being less-than-perfect, it’s worth noting the shoes respond to tightening and loosening the laces in different spots, and you can eventually get a fit that works for you. After recently getting shoes that were lacking in this department, I’m extremely happy about the generous breathability of the Transcend 5. It’s not such a problem now in February, but spring is nearly upon us, and Texas gets hot sometimes. As the warm weather keeps coming in, I’m going to appreciate this more and more. 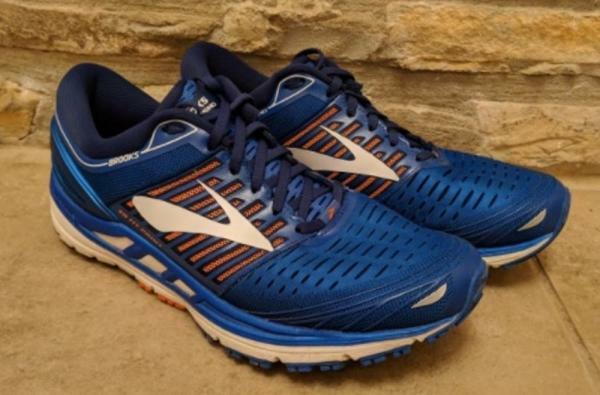 Brooks advertises these as among their most cushioned shoes and based on previous experience, I recall Brooks shoes as cushier than normal in the first place. These are certainly above-average in the cushion department, but I’ve seen more. In this case, I’m calling that a good thing. Any more cushion than these would be a trade-off; it might be more comfortable, but it would sap your momentum, like running in sand. The amount of cushion found in the Transcend 5 is appropriate for someone who wants cushion for a high-mileage trainer but still wants to be able to run as well as jog. I train enough per week that a small amount of stability isn’t a bad idea, but my form doesn’t need correcting. Since I don’t need a stability shoe, it’s rare that I buy one. As such, these are the most stable shoes I’ve worn in years. Sometimes I notice, and sometimes I don’t - when your form is already good, you’re naturally doing whatever a stability shoe should be encouraging. The problem I have with stability shoes is they’re stubborn: they act like there’s only one “correct” way for your feet to hit the ground, and when taking a corner or running on an uneven trail, sometimes these shoes and I get into an argument. If you’re going to stick to roads or well-groomed trails and you don’t lean into turns, these shoes will do well for you. If you need the stability, which I don’t, you’d probably like these more than I do. The tread on these is road-first, and they work well for that application. There’s also enough going on that they handle well-maintained trails just fine. I occasionally have to take it easy on a hill or a sharp turn on some of my local trails, but it would take one hell of a rugged trail runner before I’d charge through those with no hesitation. Brooks claims the tread pattern helps disperse impact throughout your foot, but it’s hard to tell if that’s true or if it’s simply a matter of the Transcend being a cushioned stability shoe. Orange and blue don’t always go well together, but sometimes they do. This is one of the times they do (I think the trick is to use about a 3:1 blue-orange ratio). I like the blue-orange look enough that I’m considering moving over some bright orange shoelaces from a pair of Nike shoes that are nearing retirement...but I probably won’t, because the slightly stretchy shoelaces on the Transcend 5 are higher quality, so I’ll keep them. After doing this little-known activity called running, they still look good, even the white parts on the outsole, which intelligently don’t come in contact with the ground. I like that Brooks put a reflective accent on this shoe, but they could’ve done better. Only one spot, about the size of a fingernail, though it’s in the most important place: the rear. The “reflective” marks on the toe are fake; they’re silver in color, but not reflective. There’s a gigantic logo on both sides of the shoe; why not make that reflective? It would certainly make the logo get noticed. The Brooks Transcend 5 is not for me, but that doesn’t mean it's a bad shoe. They’re good and despite not being perfect for my feet, I’m going to keep running in them once per week. If words like “cushion” and “stability” are music to your ears, give these a look. All the same, I’m giving the Transcend 5 a score based on my experience, not what I imagine others’ experiences will be. If these shoes work as well as I think they will for their intended audience, then their average score will deservedly be higher than mine. To close on a good note: I believe these are the only shoes I’ve had where the actual weight matched the advertised weight exactly. You’d think that’d be a simple task, but it’s rare. The Brooks Transcend 5 is a road running shoe that is ideal for wearers who need additional support. It uses the updated Guide Rails that aims to guide the runner's foot to a more natural and smoother transition throughout the gait cycle. This version is focused on providing heel stability. Additional heel support and comfort is offered by its cradle design. When the heel stays in place, the rest of the foot is likelier to do the same. Featured on the outsole are the Ideal Pressure Zones. These are strategically-designed to disperse stepping impact throughout the entire foot. As a result, wearers will have a smoother and more comfortable running experience. The durable and lightweight external heel counter cradles the heel efficiently and reduces excess heel rotation. The Brooks Transcend 5 is available in standard lengths. The model uses measurements that follow the preferences of runners. Because of its ability to adapt to the shape of the instep, it provides a more customized fit. The available widths for both the men's and women’s versions are medium. The Flextra is integrated into the Brooks Transcend 5. This flexible and responsive rubber material provides the right amount of flex for the foot. It ensures to accommodate the weight and gender of the wearer. It also offers additional traction. Featured on the outsole is the Blown Rubber. It is a durable compound that is essential in shielding the midsole section from wear and tear. This material provides added cushioning to the runner's foot. Distribution of pressure during each step is offered by the Ideal Pressure Zone. Acting as a stable platform, it is focused on balancing the spread of energy impact throughout the entire foot. As a result, the runner will experience a more comfortable and effortless ride as well as float-like transitions. Utilized in the midsole area is the Super DNA. This material provides additional 20% cushioning when compared to the Brooks cushioning technology called the BioMoGo DNA. The goal of which is to conform itself to the natural shape of the foot. It gives a comfortable and plush ride that is specific to the needs of the wearer. The updated Guide Rails which are also used in the latest version of the shoe, the Transcend 6, are strategically-placed around the platform of the Brooks Transcend 5. These components of the shoe give an enhanced and holistic support to the runner. It is significant in leading the runner's foot towards a smoother, more natural and stable stride. It reduces shin and heel rotation and keeps excessive knee motion in check. The S-257 Cushsole compound aims to deliver additional flexibility and cushioning. The Double Omega Flex Grooves aims to allow the midsole section to be more flexible without compromising the quality of the foam material. More agreeable forefoot and midfoot strikes, as well as smoother landings, are offered by the Rounded Heel design. The Profile Sock Liner is utilized in this shoe. The material is made from BioMoGo. Aside from giving additional cushioning, it also delivers contoured support to the natural curves of the underfoot. The upper unit of the Brooks Transcend 5 utilizes the breathable mesh and textiles. It allows better inflow and outflow of air into the foot-chamber, offering a well-ventilated coverage. The Element Lining is placed underneath the upper. This material is essential in managing moisture, keeping the interior environment fresh, healthy and dry. The Conformable Saddle Construction aids the upper fabrics to hug the mid-foot. As a result, it locks the runner's foot in place. It also prevents the foot from wobbling during the running activity. The 3D Fit Printed Overlays are added in the upper section. This component provides more structure to the Brooks Transcend 5's upper. These fused layers are strategically placed into the shoe to give a seamless yet more secure fit.